We begin our first meeting, The First Interview Experience®, by gathering important information about our clients, their families, their current financial situation, and their financial goals. We seek to understand what is important to our clients and why. Our goal for this meeting is to formulate a Personal Values Statement (a mission statement that speaks to why people make decisions and what they hold most important in their lives). This statement becomes a foundation for our clients' continued success. Next, we develop a personal Financial Foundation Assessment®. This is a comprehensive package for review, which incorporates the information gathered during our first interview. We will compile a personal values statement, goals, milestones, dangers, opportunities, and strengths into a financial planning strategy. At this point in our process, we agree to enter into a client/advisor relationship. The Personal Foundation Plan® is a blueprint for success. During this step of our process, we create a snapshot of our client's current reality and model what accomplishments will be necessary in order to potentially achieve an ideal future. The advisor presents a financial plan during the Plan Presentation Meeting, which illustrates assumptions and projections based on the data provided. The purpose of this plan is to provide a simple-to-understand outline of how financial decisions are made. Once we have created a customized plan, selecting the right tools for the job is essential. Our advisors, in conjunction with our portfolio services team, will utilize The Financial Solutions Toolbox® to diversify* a client's portfolio based on their risk tolerance. Our clients accounts are diversified through strategically investing in several asset classes, including, but not limited to exchange traded funds (ETFs), annuities, alternative managed futures, private equity, real estate investment trusts (REITs) and mutual funds. Getting on track is important, but staying on track is paramount. Our advisors will conduct a Milestone Review Meeting with every 6-12 months to carefully review all the accomplishments made for each milestone. As our relationship matures, the Milestone Review Method® allows us to make adjustments, celebrate achievements, and ensure that our clients are on track to meet their goals. 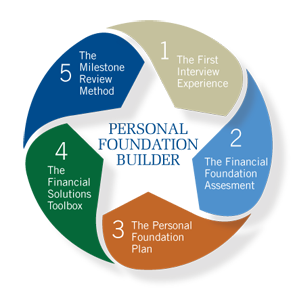 The Personal Foundation Builder® is our unique process, designed to enable our clients to make personal accomplishments with the tools and guidance from their advisor and team at Financial Foundations. The Personal Foundation Builder® allows us to deliver superior results and a personalized experience.